So you gripe about the lack of women in FLOSS and crack wise about meetups being “boys’ clubs” and make some vague intimations about the need for diversity in our communities, but have you done about it? Watcha gonna do about it? Well here’s one thing you can do about it here and now. Give to The Ada Intiative TODAY. 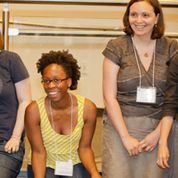 This is a picture of my smiling face last year at AdaCamp in Washington, DC (standing next to the ever-brilliant Marina Z. from Red Hat and the GNOME Outreach Program for Women!). AdaCamp was an inspiring, educational, and uplifting event for women in free software, free culture, and free stuff and it was one of the first time I realized and truly felt like I was part of the FLOSS community. I made connections, I gained skills, I spoke about what I know and what I’ve done and people listened to me and I in turn listened to them. We laughed, we gasped, we cheered and sometimes jeered. I met truly incredible women from around the country and around the world and we all left there even more committed to lifting women up in our respective areas and throughout the world of open stuff — with our words, voices, actions, and (when possible) our funds! I am an Ada Initiative donor. I set up a recurring Paypal donation that just takes the cash from my account every month. No muss, no fuss. Or you could do what my good pals Sumana and Leonard did and give a huge lump sum by setting up a matching challenge. Or you could leave a bequest. Or you could just toss them a coupla bucks. Whatever you do, do it now! Put your money where your mouth is by clicking that big red button and supporting The Ada Initiative!